﻿ Ozone Forum of India: What is Ozone? 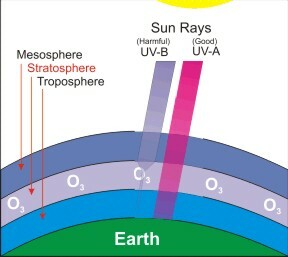 Ozone (O3) is a gas mostly found in the upper strata of the atmosphere known as the “Stratosphere”. Ozone is also found in smaller quantities in the “Troposphere” which is the atmospheric band closest to Earth. The presence of Ozone in the Stratosphere blocks harmful Ultra Violet radiation from the Sun and hence is helpful. The ozone molecule consists of three atoms of oxygen; it’s chemical formula is O3. Process Water treatment & purificationt a few. however the best use of Ozone gas so far has been its usage as a medical therapeutic mode.